The intriguing and exciting story of how the space combat hero of the Alliance began his command journey has been brought to life in a new scifi audiobook by SciFi Publishing. SciFi Publishing is pleased to announce the release of its newest scifi audiobook, "Bitter Glory (Crimson Worlds Prequel) ". 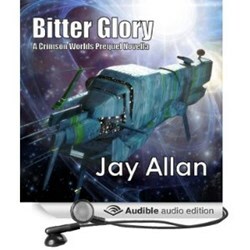 Bitter Glory, written by bestselling scifi author Jay Allan, is now available on Amazon, Audible and Itunes. http://bit.ly/19evweY. In this story shortly after he takes command for the first time he comes before an enormous enemy ship with little backup. He soon learns that also nearby is his first love trapped in a dying ship. The young Garret driven by ambition and the quest for glory works to both destroy the enemy ship and get to her in time. But war in space is brutal, and the consequences of command decisions can haunt even the strongest commanders. Will Garret win glory? Is he prepared to pay its cost? 5.0 out of 5 stars "Great Stuff!" 5.0 out of 5 stars "Another Awesome read!" 5.0 out of 5 stars "Excellent job!" For more information about us and to discover other great audiobooks, like Jay Allan’s Dragon’s Banner visit us at either http://www.scifi-publishing.com or http://www.scifi-audiobooks.com.